Over the weekend, Iggy and the Stooges performed an intimate concert at New York City’s Le Poisson Rouge, which was streamed online by NPR Music and WNYC’s Soundcheck (watch the full replay here). Rather than hit the road, however, the legendary outfit stuck around the Big Apple Monday evening for their first-ever appearance on The Colbert Report. 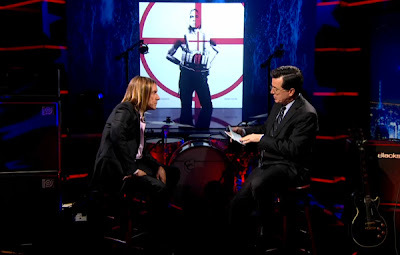 In a slim suit and “almost a shirt”, Iggy Pop sat down in Colbert’s hot seat, where he regaled the host with tales of his first mugshot (“I fell asleep at the wheel”), his deference to punk rock (“I was just a simple kid”), and why he always performs sans shirt (“The Pharaoh of Egypt never wore a shirt”). Shortly after, Pop dismissed the suit, tossed on a crossing guard’s vest (? ), and joined his band for a performance of “Job” from their new album Ready to Die. He eventually responded to Colbert’s previous question of ”Could you wear a shirt or would your body reject it like a bad organ?” by throwing the guard’s get up into the crowd. What a guy. Ready to Die is out now via Fat Possum Records. The album marks the first time Pop has worked with guitarist James Williamson and drummer Scott Asheton on a full album since their 1973 classic, Raw Power.